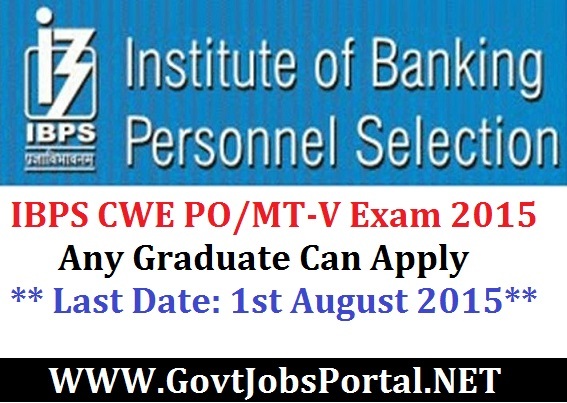 IBPS, has released the official notification regarding IBPS CWE PO/MT-V Exam 2015 and inviting application from all Eligible Indian graduates for filling up the vacant positions in various participating banks all over country for the Probationary Officers & Management Trainees Posts. For information related to this IBPS PO/MT Exam Notification 2015 like Educational Qualification, Age criteria and other eligibility required for this job application read the below article carefully. Also must read the official advertisement in detail before online applying. Post Name: Probationary Officer/Management Trainee. Educational Eligibility: Minimum Graduation or its Equivalent Qualification is needed to apply for this IBPS CWE PO/MT-V Exam 2015. Age Criteria: (As on 1st July 2015) - Between 20 years to 30 years. Mode for Apply: Candidates have to apply online through their official website www.ibps.in. Registration will be start from 10th July 2015.